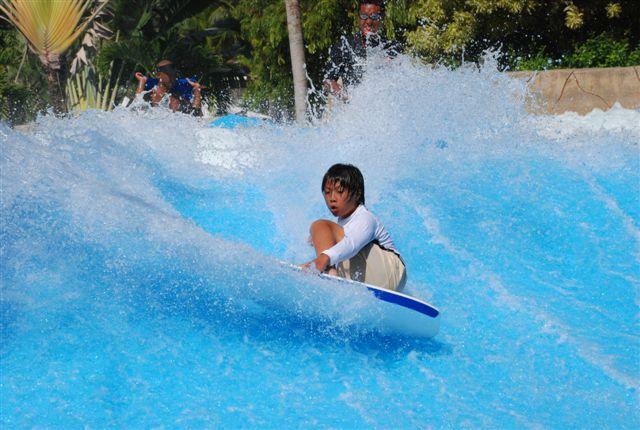 This past weekend, the Pacific Islands Club Saipan hosted the 4th Annual International Point Break Challenge, inviting recent winners from the contest in Seoul at Caribbean Bay in August 2010. Co-sponsoring the event was PTC (Monster, Pepsi, Gatorade), DFS, Borderline, Delta Airlines, Triple J Wholesale, Quicksilver, BSEA Sunsports, Docomo Pacific, Tony Roma’s, Hard Rock Cafe. and PIC Saipan. Participants included 6 women, 16 men, 7 standup (men&women), and 4 kids ages 12 and under from Korea, Japan, and Saipan. All competitors showcased their talents in a minute freestyle portion while the final round consisted of a minute and a half to perfecting their performance. Four judges reviewed each competitor based on fluidity of transition from trick,s as well as level of difficulty and precision. In the Men’s Open Division, Japan’s Yu Suzuki captured the title with his fluid freestyle performance, integrating a variety of moves within the allotted 90 seconds in addition to his impressive, continuous spins. For his effort, Suzuki won the US$500 cash plus Quicksilver merchandise, 300 Delta Skymiles, and a Docomo Chair. Saipan’s own AJ Sablan came in second place and was awarded US$300 cash, Quicksilver merchandise, 200 Delta Skymiles, and a Docomo chair, while Korea’s Jung Doo Kyo in third, won US$200 cash, Quicksilver merchandise, 100 Delta Skymiles, and a Docomo chair. In the Women’s Open Division, Kim Soo Hee, Korea’s Caribbean Bay title holder defeated the other women in her competitor group and earned the coveted “4 Night Stay for Two at PIC Saipan” in addition to a US$125 DFS gift certificate, Roxy gear, and a Docomo chair. Saipan’s Minerva Cabrera and Japan’s Yasuko Okuwaki placed second and third, respectively, as they each won cash, rashguards, DFS gift certificates, Docomo chairs, and Roxy gear. The Flowboard (standing) Open showcased competitors seeking to mimic surfing by carving the waves and interspersing their moves with spins and turns. The top three competitors all hailed from Saipan as Derek Gersonde bested his competitors and won a new stand up board, US$125 DFS gift certificate, rashguard, Waterpark&Magellan Lunch for Two at PIC, boardshorts, and a Docomo chair. Keoni Ichihara and Dan Westhphal in second and third place, respectively, went home with cash, Delta skymiles, PIC gift certificates, clothing, and Docomo chairs. Ryou Min Kyu of Korea topped the Kids’ Division and won a PIC’s Waterpark&Lunch certificate, as well as a rashguard and Docomo chair. Quintin Ramsey, Will Johnson, and Colin Ramsey rounded out the Kids’competition and each won great prizes. The Monster Trick award went to Korea’s 2010 Flowrider champ, Kim “Rain” Hyun Su for his double twisting back flip, while PIC Clubmate Taryn Holvik received the Delta Airlines Spirit Award for competing among all men in the Flowboard Open division. Next year’s International Point Break Challenge is slated for September 24-25, 2011.